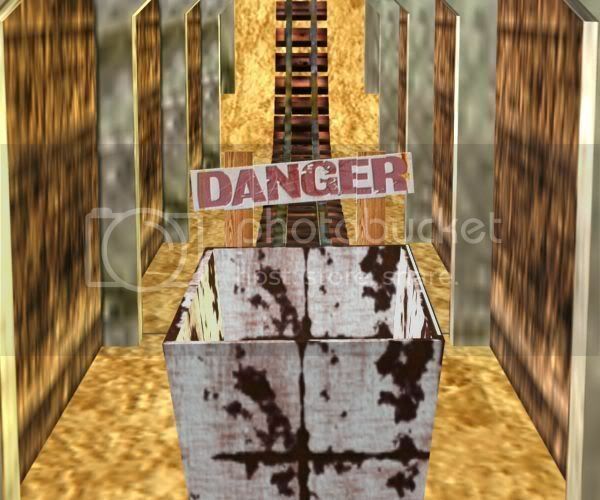 I have almost finished my runaway mine cart animation and have started to add some lights. How do I make light come from inside of the gas lamp I have made in the pic below? just position a local light as a child of the lamp in scene mode, and voila! you might want to play around with the glass bit, maybe make it more see-through, and perhaps give it some emissive, so that it looks like it's glowing as a result of having the light in there - the light probably won't affect the lamp itself properly, if it's inside, which is why i think emissiveness on the glass might be a good idea. 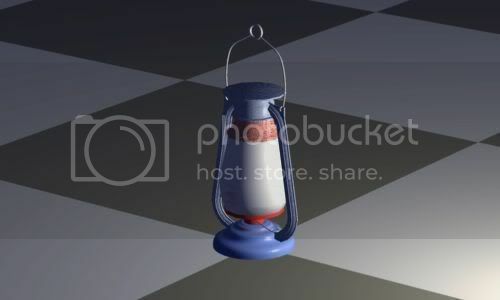 Also, if you plan on using shadows, you'll need to make the glass of the lamp a different object, then add it in the scene and make it a child of the rest of the lamp as well. You want to do this because you don't want the lamp glass/shade to cast shadows. Otherwise the light wont actually affect anything. Thanks guys. I would prefer the lamp to cast shadows in the tunnels and over the track and cart as it goes past, I'll give it a go. I will need about 50 single lights aroung the track so it could take some time. Not sure if you can see it in the pic, but when I render that lamp I get a strange stripped effect only on the top red and blue parts. If you are using volume shadows, you can get stripey things like that. Use raytraced shadows instead, volume shadows don't yet work properly. Regarding the shadow problem, you can place a light within the gas lamp, as thecolclough suggested, and enable shadows on the light, but disallow the gas lamp object element from casting shadows itself. Double clicking the gas lamp in scene mode opens its properties box, and you can make sure the "casts" check box is not selected. That way the light will get out of the lamp, but it will get out evenly in all directions. Hihosilver's method would give a more accurate result, with only the glass not casting shadows, but the base, top and side struts of the lamp will cast large shadows around the place. Softening the shadows will help, but you would be well on the way to very long render times. Feel a bit of an idiot to be honest. I had managed to duplicate a couple of the parts on top of each other and that was giving that strange effect. That little lamp took under an hour to model as it's not very complicated. The runaway mine cart is fully animated now just adding the last few tunnels and then I'll add the lamps and lighting. cool i'm really looking forward to seeing this finished, it sounds like it's going to be quite a fun video to watch (i like tunnels and underground places ). are you going to put it on youtube? Not sure about youtube yet. Should be able to finish it now though, just got an extra 2gig of mem, graphics card and a core duo2 chip (that was the best my motherboard would support). I agree, I used the red & blue to make modeling a little easier. I plan to give the lamp a kind of rusty old look. Yeah that would look impressive! An old rusty lamp on an old rusty cart. That would be pritty impressive for the lighting effects, what else is in your animation? Here's a quick screen shot, I have not added any of the props yet.